Last Saturday I attended my fortieth high school reunion. As I entered the hotel lobby it suddenly struck me how long ago it had been since I had seen my classmates. 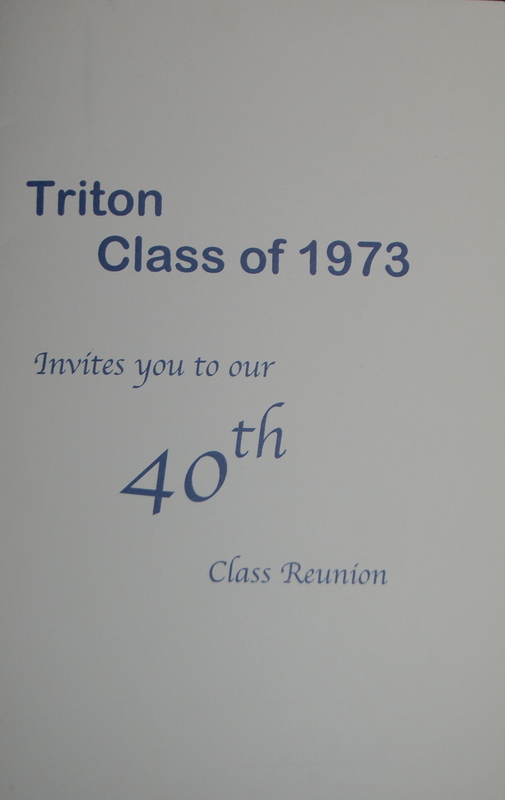 The class of 1973 was the second class to graduate from our newly minted Triton Regional High School. We had spent two years at Newburyport High School before Triton was built. The switch to our own regional school meant smaller classes and a new identity. Many of us had been friends since kindergarten. Suddenly the years dropped away, I peered into faces and saw younger versions of the adults smiling and laughing. Memories flooded back and crazy escapades rushed to mind. There were solemn moments, names were mentioned and I learned who was there in spirit only. We grilled each other on the whereabouts of those who couldn’t make it. Conversation flowed so easily as we filled in the blanks; Where do you live? Do you have kids? Grandkids? How are your siblings and parents? What have you been doing all these years? I couldn’t help but feel a twinge of jealousy of those who had stayed in touch over the years and kept those friendships strong. There was a sense of camaraderie and permanence in those bonds. They, perhaps, saw the changes life wrought as more subtle; easier to reconcile. I saw a huge leap from the rebellious youth of the seventies to the mature parents and grandparents before me now. We had all started out with dreams and expectations of how we would live our lives and change the world. Listening to my classmates forty years later, I realized we triumphed in ways we never imagined when we tossed our mortar boards in the air that day in June of 1973. This entry was posted in memoir. Tagged class of 1973, classmates, high school reunion, Newburyport High School, reunion, Triton Regional High School. I have never been to a class reunion, although I have fantasized at what it would be like. I can imagine the girls from the “in crowd” to still be palling around and the “stoners” would be the ones that were unable to attend due to incarceration (or worse). I’ve often wondered where I would fit into the mix. I was a loner then and still tend to be one now. Like you, my life is nothing like I envisioned all those years ago. I graduated high school and went straight into the Marines, thinking that would be my life. How things change! Hey Laura, thanks for the insights and comments. I was really surprised at how folks lives had turned out and how happy everyone seemed, despite what life may have handed them along the way. I am glad I went, wish I had gone more often during the years. It reinforced my belief that people do change in many ways but the core good remains. Martha I haven’t seen you since Orcland Farms days…. We all had so much fun. I didn’t graduate from Triton but am friends on facebook with quite a few triton Alumni. Say hi to your brother from Bobbi and Suzy Gynan! OK, I am speechless! Bobbi and Suzy! Orcland Farms! I guess this internet thing is OK after all!! I am so happy to hear from you, this is amazing. Alas, we lost Duncan years ago but he smiles down on us all with his “Clint Eastwood grin”. Your photo could be Hanni!!! You are a brave soul for going. Hope you made some re-connections you will keep! Martha was so GLAD you came.You have not changed a bit. Still as lovely as ever. 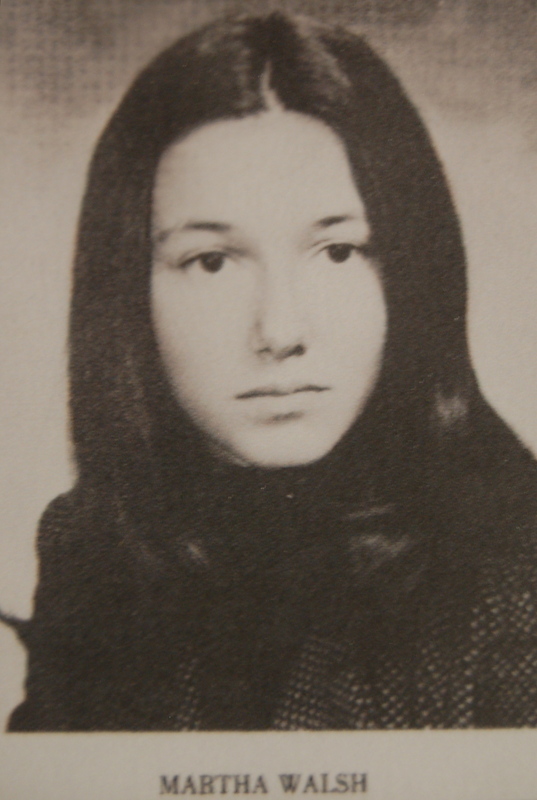 Loved your article I will share it on our Facebook page Triton Class of 1973 please join it would love to keep in touch with you. Finding you guys has made my whole year! Martha – it was great to see you at the reunion! Your writing captured what a lot of us were probably feeling and you put it so eloquently. I look forward to reading more of your blog! Thank you Judy. I loved seeing you and your husband, Jeff and his wife…the years just melted away. And thanks for reading my stuff! Nicely said, Martha! I wish I could have gone to the reunion, but, I will definitely plan on the 50th if I am lucky enough to reach the age of 68! I’m hoping it wasn’t too much of a pain and maybe Stephanie and crew will do one in five years?? Well just look at all the new old friends you have! That’s great! You deserve something for just managing to graduate high school in the 70s. Thanks Alan, I think the standards were a bit lower in those days! I’ve only ever been to one school reunion, about three years after we all left. That was a sad occasion because one of our number, my best and oldest childhood friend, had just died suddenly. I’m not sure we’ve ever had another one, maybe I just wasn’t invited. Marie, reunions are a big thing here both for high school and college. I have been remiss over the years but now that I have attended this one, I won’t miss another. I’m sorry to hear your occasion was to mark a sad passing, but what a wonderful way to honor that friend.